This title is an analogy to the famous (academic) quote (and reality) ‘Publish or perish‘, which emphasises how much vital it is for scientists to publish if they want to ‘survive’ in the academic world. To this end, I’m obviously relieved to learn that my third article co-written with my two supervisors (Prof Hazel Hall and Dr Colin Smith) has been accepted for publication in the Journal of Librarianship and Information Science (JOLIS). Moreover, it also acknowledges the validity of my study, even though I’m not done with it yet. Discussing with my colleagues from university (this includes my PhD mates as well as members of the academic staff) – I found out that everyone has been through a writer’s block during the writing of their thesis. And not only once. My supervisor warned me recently that I’m not writing a book, but a thesis (which is never finished and yet has to be finished at some point). An academic friend of mine also told me that the thesis is entirely different from writing a book because you don’t have the choice to finish it. Writing a thesis he said, is like banging your head against a brick wall, until a breakthrough occurs. Sounds fun, isn’t it? Well, at least I can testify that my head is certainly banging on the writing block, so maybe I’m on the right path after all. The impostor syndrome, which can lead to procrastination, and bring up all kind of emotions such as fear, guilt, lack of trust, comparison, perfectionism, and so on, does not facilitate the process of writing of course. Much as been discussed on this phenomena, since it concerns many writers (academics or not). Plenty of books, seminars, articles, providing all kind of support and advice are available for those of us who are affected by this so well known syndrome. I did read some of these books, articles, blog posts, and even attended seminars. Yet, the problem seems to persist. So what can be done? I feel, that it has more to do with an inner ruthless resolution. With gathering the courage and faith, that this work is going to be done, no matter what. The thought that this thesis might not get written – which would consequently lead to failing my PhD – isn’t quite pleasant to consider after all. When I think about all the sacrifices that not only I but also all the close family and friends have made for me to be here, it helps me to pursue my efforts, out of respect for them, and for myself. This insight could quickly shift to a threatening pressure though, which would bring me back to the writing block, and that’s not the point. I think the trick here is to be grateful. Grateful for being here, in this overall process, however difficult it can be. Grateful for this once-in-a-lifetime opportunity to do a PhD and writing a thesis. I’m not alone. Support is always here and now, coming from another dimension I too often overlook. To remind myself that I started this PhD out of (spiritual) faith reminds me that what matters is the journey itself, not so much the destination. This helpful book I’m presently reading, and the rest I’m having out of a few days of illness, gently bring me back to a zone where I slowly feel again in alignment with myself. May this reconnection lead me towards action and the completion of my thesis. This is a wee message to inform you that I have now moved to Slovenia, a hidden gem nestled between Italy, Austria, Hungary and Croatia. 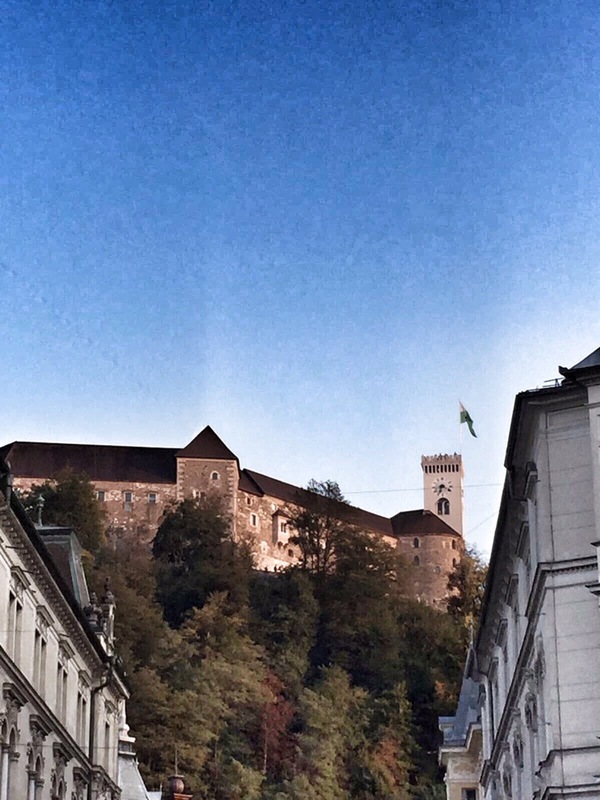 I already miss Scotland, but Ljubljana, the capital of the country where I’ve settled in, also has a castle on a hill, which is a really nice reminder of Edinburgh where I used to live. Otherwise, nothing much has changed. I will keep on working on my PhD and blog about it here, with now and then a few hints regarding my new location. I’ve just come back from the ECKM Conference in Barcelona, the head full of ideas and the heart full of memories, and I wish to report here some of the moments and insights that have been meaningful to me. I arrived two days before the official launch of the conference so that on the day of my arrival, I could meet with Dr Angel Borrego, Head of the ‘Facultat de Biblioteconomia i Documentació‘, at the Universitat de Barcelona. He introduced me to the various programs delivered by the Faculty, as well as its rich history. Jordi Rubio i Balaguer, one of the Directors of the School of Librarians. The department provides various programs in the field of Information Sciences to undergraduates and graduates students, with the possibility to undertake a PhD. If the number of students seems to slightly decrease, the employment rate for those who have accomplished their studies remains high. For the anecdote, the ‘Escola Superior de Bibliotecàrie’ was opened more than 100 years ago, in 1915, with the aim of improving the access to culture and knowledge to the population. The school was only opened to women. This might sound pejorative, but actually, it was the first time that women were given the opportunity to have an official professional position. The school finally got opened to men in the early 80s, after having joined the University of Barcelona. I’m very thankful to Dr Angel Borrego for having taken the time to welcome me during my short journey in Barcelona. Designing a Successful Knowledge Management Strategy for Public Sector Organizations: How can this be Achieved? Led by Dr Fábio Ferreira Batista, Catholic University of Brasília, Brazil. This workshop was an opportunity to learn from the winner of the Second Knowledge Management and Intellectual Capital Excellence Awards – 2016 and be inspired by a best practice case study. The future of KM: short-time goals and long-term vision. Led by Ettore Bolisani, Alexeis Garcia-Perez, Malgorzata Zieba and Sandra Moffett, International Association for Knowledge Management (IAKM). This workshop was an opportunity to discuss and elaborate on three different themes: 1) KM research and practice: challenges and opportunities; 2) Innovation in KM teaching, learning and assessment practices; 3) Towards a global KM expert: the views from workshop participants. These workshops also provided the opportunity to meet some of the participants of the Conference and reflect on KM practices and theories while discussing it with academics and professionals. On Thursday the 7th of September, the ECKM 2017 was officially launched. About 200 participants gathered for two days of knowledge exchange and discussions on a variety of themes, all related to Knowledge Management. Needless to say that my main challenge has been to choose among the 140 (!) sessions available (which can be quite a frustrating process!). Finally, I’ve been really satisfied with my selection. It would take too long to sum up all of them here, but some interesting themes have certainly caught my attention, such as: the influence of ’emotional intelligence’ over KM, the use of virtual reality within knowledge networks, emotional barriers for tacit knowledge sharing, social media adoption for knowledge sharing, the difference between evaluations and audits, the damage of mistrust in regard to knowledge sharing, and last but not least, a yin-yang perspective on organizational systemic change. Each of these keynotes was really interesting, providing a different point of view on the multiple characteristics of knowledge. The last one given by Prof. Eric Tsui was particularly stunning, as it made us aware of the future challenges and opportunities that knowledge workers will face in regard to knowledge access within the Cloud. I’m aware that it is going to sound presumptuous, but of course, the pinnacle of the ECKM Conference 2017 for me, was the occasion to present my paper “Skills in Sight: How Social Media Affordances Increase Network Awareness” co-written with my supervisors Prof. Hazel Hall and Dr Colin Smith. It is the first time that I’ve been able to present a full paper among other scholars in front of world experts in Knowledge Management. Honestly, I felt half excited, half terrified by this perspective, but I was (for once) quite confident in my work and the results I was about to present. A bit less than 20 people showed up to find out about my research. My presentation went well, and I was pleased to answer and discuss the few questions and comments that were being asked or expressed: one of them was related to the social affordances provided by the Knowledge Hub platform; another one was an approval of the necessity to distinguish skills from expertise, which was precisely what I had specified at the beginning of my presentation. All in all, this ECKM conference has been a very satisfying experience and my very first steps in the KM “big league” 🙂 Indeed, it has been a relief that I could finally discuss my research with other attendees without worrying if I was going to be understood or not – a feeling that I didn’t always have during other conferences… For the very first time in my short academic life, I’ve had the feeling that I found my academic family. I cannot emphasise enough to what extent the location of the Conference contributed to enhancing the overall experience of this journey, making it so enjoyable from the beginning until the end. It was the first time that I went to Barcelona (and actually in Spain), and I’ve been amazed by the beauty of this Catalan city. From the fancy seaside to the impressive Gothic quarter and the quiet district of Sarrià-Sant Gervasi, I’ve had several occasions to be soaked up by the magic atmosphere that this city has to offer. I will definitely go back there, with the hope of enjoying more thoroughly the richness of its culture. I would like to officially thank the CILIP association for having awarded me the John Campbell Trust Conference/Travel bursary last year, as it has allowed to attend this event in Barcelona. It was a golden opportunity for me to present and discuss my research with an academic audience of world experts in knowledge management, that I am not ready to forget. Finally, I would like to thank my dear supervisors for their continuous support in my work and their priceless trust in me. I would have never been able to present this paper without their contribution and wise advice. Last week, I’ve had the honour to present my second academic paper during the i3 2017 conference at the Robert Gordon University in Aberdeen. It presents preliminary results from a survey undertaken by members of an online social platform, Knowledge Hub (KHub), that incorporates social media features and enables knowledge sharing amongst public sector professionals. It also addresses the concept of ‘Ba‘ in relation to tacit knowledge sharing in online environments. Since this concept is not very known and a little bit challenging to understand, I intend to shed light on its meaning and why I find it relevant to my research. The concept of ‘Ba‘ originates from Japan and can be challenging to understand, particularly for the dualistic western mind (by dualistic western mind one needs to refer to the Cartesian consideration of mind and body). Inspired by the work of the existentialist philosopher Kitaro Nishida, the concept was brought forward through the work of Nonaka and Konno in 1998, with the intention to facilitate the understanding and integration of the initial SECI model of knowledge conversion (invented by Nonaka in 1994). The ‘Originating Ba‘, is an existential place in which employees can potentially share their experiences face-to-face through a primary socialisation process. A place where individuals share emotions, feelings and ideas informally. Here, the culture of an organisation is communicated in an implicit way. This space is strongly related to Nishida’s existential vision of reality. The ‘Interacting Ba’ (also called ‘Dialoging Ba’), is a place in which knowledge and skills are shared among peers through an externalisation process. Here mental models of various employees (selected to form a team) are discussed by individuals who are also invited to reflect on their own knowledge. Dialogue is therefore crucial in this process. In this space where the conversion between tacit and explicit knowledge occurs, the worlds of Nishida and Descartes can meet. The ‘Cyber Ba’ (also called ‘Systemizing Ba’), is a virtual place (or world) in which explicit knowledge can be exchanged in a systematic way. It is usually supported by collaborative environments using information technologies, facilitating knowledge sharing between groups. This includes online networks, databases, and online platforms. This place is dominated by the Cartesian logic. The ‘Exercising Ba’, is a place in which the absorption of new knowledge happens through an internalisation process. This is where the learning process occurs when individuals absorb and synthesise the knowledge made available to them. It includes focus training and tutoring, where knowledge is translated into action. The worlds of Descartes and Nishida meet again, in a conversion process of explicit knowledge to tacit knowledge, before moving towards the ‘Originated Ba’ again. Tacit knowledge is personal and highly contextual. Therefore, the need to investigate the variety of contexts within which tacit knowledge is shared is essential. In 1998, the Cyber Ba was the only ‘place’ where Nonaka & Konno anticipated a role for technology. This was the time of the Web 1.0, where online databases and basic Intranets were often used as information depositories. Since then, there has been an exponential growth of social media tools (based on the Web 2.0 technologies) which have enabled and facilitated online social interactions, networking and collaborative work. One relevant outcome that emerged from this first data analysis of the online survey, is that other types of ‘Ba‘ (besides the ‘Cyber Ba’) could actually also occur online. For instance, a majority of respondents have positively confirmed that ‘Problem-solving‘, ‘Expertise sharing‘ and ‘Innovation‘ are facilitated by the online social platform KHub. Each of these tacit knowledge sharing practices requires active social interactions, which is one of the fundamental aspects of the ‘Interacting Ba’. A majority of respondents have also positively confirmed that ‘Learning processes‘ are facilitated on KHub, which corresponds this time with the characteristics of the ‘Exercising Ba’. This is important because it means that twenty years later, the Ba model could be updated in regard to the emergence of social media affordances. I am not the first one to make this assumption, other scholars have. To the extent that some of them (such as Martin-Niemi & Greatbanks, 2010) even suggested that the ‘Originating Ba’ could also be online (particularly with the use of blogs). At this stage of my research, I’m not convinced by this statement. Especially since the Originating Ba usually requires face-to-face interactions and a physical situational context (see the Epilogue below for a deeper understanding of this Ba). However, it is my intuition that if there was one technology which could simulate such ‘place’ of ‘pure’ tacit knowledge, it would have to be an online interactive video conferencing platform (such as Skype, Google video or more recently Zoom). This is an exciting field of research which certainly deserves further empirical studies in order to investigate to what extent such technologies could replicate pure tacit knowledge. I reckon that Virtual Reality technologies will also contribute in a significant way in that matter, particularly in regard to situational contexts (which are partly absent from online environments). As this blog provides a place in which I can express myself more freely (including some of my personal interests that cannot be included in my PhD work), I would like to end this post with some complimentary explanations regarding the ‘Originating Ba’, which is very rarely mentioned in the literature, but nonetheless essential to my eyes. The ‘Originating Ba’, according to Nonaka & Konno (1998), is, as mentioned earlier, an existential place within which experiential tacit knowledge is shared. But what is also mentioned in their article, is that this is a place where an individual can feel sympathy and empathy for others, and where ‘the barrier between the self and others‘ is removed. Nonaka & Konno then use an epistemological metaphor to explain Nishida’s vision of reality, ‘I love therefore I am‘, which contrasts with the (more famous) one of Descartes ‘I think therefore I am‘. Nonaka & Konno even suggest further on that the ‘Originating Ba’ is a place where ‘pure experiences‘ and ‘ecstasy‘ exist, citing Heidegger’s definition of ‘being thrown into the world‘. This space, where face-to-face experiences are a key to the conversion of tacit knowledge, is where care, love and trust emerge, providing the ideal place for the knowledge-creation process to begin. Would the sharing of tacit knowledge be a genuine act of love? An altruistic volition of sharing some of ‘our’ knowledge (or ourselves?) to others for the sake of the common good? Local GRAD school 2017 – lessons learnt. Last week, I’ve had the chance to attend the Edinburgh Local GRAD School among other PhD students from all over Scotland. The aim of this training was to give us some space so that we can become more aware of our personal and professional transferable skills. There were a lot of group activities, some workshops, and plenty of opportunities to meet other PhD students to discuss our research or chat about PhD lives. The program was intense and challenging, and not much time was left on our own to reflect on all the activities we were involved in. However, there are a few lessons learned that I would like to share here, by sharing the insights of one particular exercise. The very first activity we were asked to do consisted of creating an innovative widget, starting from the scratch. The only guideline we received was to create something which is useful to the society. Each group had 1 hour to create a prototype, that would be then presented to the rest of the entire group, allowing us to explain the concept (technical challenges, management issues, overall purpose, etc.). One hour is not much time when you need to create something new with people you hardly know and who come from different scientific fields. Where do you start? How will you proceed? And how will you organise yourself? Within a few minutes, we somehow all agreed that it would be more simple to focus on one problem that needs to be fixed (rather than creating something ‘out of the blue’). Lesson 1: Defining a problem will help you discover the potential solution. Instead of starting something too big (worldwide), we thought it might be easier to create something helpful for the (local) citizens of Edinburgh. One of the problems quickly identified was the issue related to lack of cycling routes in the city, and the danger it represents for all the cyclists. Lesson 2: Think big (global), but start small (local). If an objective must be SMART, then it seems more realistic to start with something feasible within your own environment (even if it is virtual). If the product if successful, it will become global. We were asked to think “out of the box”, so we have. As none of us had a background in urbanistic studies, we simply came out with the idea that bikes should be able to fly (above the cars and crowded roads). Lesson 3: Dream, and stick to your dream. No great inventions were ever made without dreaming, even if it looks crazy to the eyes of others. We are creators, therefore free to invent what we feel inspired by. Somehow, our group split into two sub-groups: one that worked on the prototype (with the material provided by the tutors), and the other one on the presentation (explaining the benefits of our concept). Lesson 4: Trust that each member of the group will eventually find its place to contribute in some way. Don’t let anyone isolated, each one has a precious gift to share. Let go of any egoistic personal desires. It is a group project, not a solo one. We had only one hour, and therefore no time to make our prototype “perfect“, but the result was “good enough” to be presented to the rest of the main group. Lesson 5: Always aim for the best, but remember that a product that is finished will always be better than an unfinished one, as perfect as it might be. The presentation of our widget was clear and well spoken. Our bike prototype was rather clumsily cute and totally hand-made (with tapes, plastic cups, paper and wires). We gave it a name: Fly High. It won the 1st price. This exercise was a wonderful example on how knowledge is co-created through social interactions, providing the perfect ground to enable collective intelligence. This was also a beautiful demonstration of the explicitation of tacit knowledge shared with one another, with the common aim of creating something new and useful to the society, with limited resources, and a lot of solidarity, essential to the success of any project. I have just learnt that the abstract I have submitted to the i3 conference 2017 has been accepted by the committee. This paper, co-authored with my supervisors Prof. Hazel Hall and Dr Colin F. Smith, will discuss the concept of ‘Ba’ and tacit knowledge sharing in online environments, a topic I will present here on my blog in the next following days.